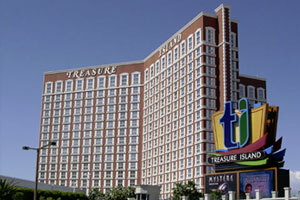 Treasure Island - TI Hotel Casino in Las Vegas Nevada is the AAA Four Diamond resort on the Las Vegas Strip that offers a contemporary style with a high-energy atmosphere. Your satisfaction begins immediately from making reservations to arriving for check-in at the elegant resort lobby. Experience the Sirens of TI in a live sea battle with renegade pirates. Relax by the outdoor pool or the spa and salon. Enjoy your choice of nine restaurants, six bars and lounges, an indoor/outdoor nightclub, and Mystere by Cirque du Soleil. Connected by pedestrian bridge to Fashion Show shopping mall, Treasure Island Resort & Casino offers one of the best locations and values in Las Vegas.